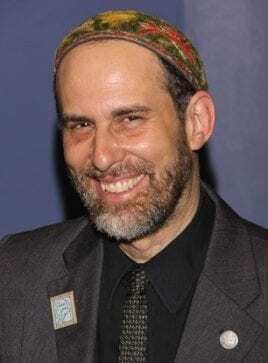 Rabbi Michael Cohen is a long time environmental activist who, while in high school, co-founded the first recycling center in Ewing, New Jersey in 1976. He graduated, with a B.A. in History, from the University of Vermont, where he also received the Paul Evans History Award for his honors paper on “Lenin’s Theory of Self-Determination and the Muslims of the Soviet Union.” In 1990 he graduated from the Reconstructionist Rabbinical College and become the first full-time rabbi of the Israel Congregation in Manchester Center, Vermont. Since 2000, he has divided his time between Vermont and Kibbutz Ketura, Israel. He has written extensively about the environment and the Middle East peace process in North American and Middle Eastern publications and is the author of Einstein’s Rabbi: A Tale of Science and the Soul. Rabbi Michael has been a visiting faculty member at Bennington’s Center for the Advancement of Public Action since spring 2012 teaching classes on conflict resolution, as well as different aspects of Biblical studies. He also served as director of community standards in the office of student life from fall 2013-fall 2015.